Many teenagers today are excellent multi-taskers. They listen to music, do homework, and text all at once. Picture a teenager nestled comfortably on the family couch. The parents have settled in to watch their nightly shows while he does his homework. The teenager has their personal laptop with social networking sites up and their cell phone going off all the time. This young person’s brain is on overload, trying to process the television, parents, homework, text messages, and computer all at once, and as a result, his homework (and thus his education) will likely suffer. Many researchers believe that multi-tasking is not actually the performance of multiple tasks simultaneously, but rather the illusion that multiple tasks are taking place at the same time. The brain appears to be switching rapidly back and forth from one task to another, and as a result every task is being done at a slower pace than if each task was completed separately. The perceived speed of the tasks comes from jamming so many into one space of time. Teenagers find this thrilling. The ability to hold several conversations while doing homework, listening to music, and baking cookies is remarkable. Their parents say they do not understand how their children do so many things at once, and the parents claim that they cannot accomplish the same tasks. This appeals to the teen’s competitive nature. Teenagers begin to believe that multi-tasking makes them special, important and productive. Sadly, multi-tasking could be harming their ability to appropriately develop through the teen years. The brain does not mature until after twenty-one years of age. Thus, teenagers who multi-task are technically doing so with an under-developed brain. The act of multi-tasking distributes actions throughout the brain and decreases their caliber. A comparable scenario would be if too many light bulbs connected to the same limited electrical supply. All of the bulbs will light up, but they will appear dimmer than if only one or two were receiving all the electricity. Similarly, a teen may complete all of the tasks, but they will do so far less efficiently and probably less aptly than if they’d concentrated on one at a time. Another drawback occurs after the fact. Recovering information received during a multi-tasking session will be more difficult than recovering information learned while intensely focusing on one particular subject. The young person mentioned at the beginning of this article, for example, will probably not remember his homework or his conversation with his parents very clearly because they happened at the same time with so many other interruptions. In general, multi-tasking as a whole is probably not detrimental, but multi-tasking during something important (homework, driving, etc.) is definitely not advisable. A teenager of the 21st century is drawn to the fast-paced appeal of multi-tasking, so it may help for parents to set some guidelines. Restrict teens’ access to social networking sites, especially during homework time, and ask them to turn their cell phone off or leave it in another room. Your teen could perform better in school as a result. It’s pretty clear that like generations that have gone before them, today’s teens have a thirst for social interaction. They’re often using gadgets to fulfill that desire, but it’s insatiable (see Part 1). 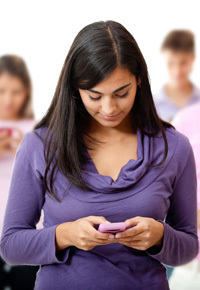 They can become addicted and are sometimes undiscriminating in what they post or text. They need guidance from mature mentors, to be sure. But there’s something they even more desperately need. The goal can’t be to “convert them” to the ways of previous generations or our own preferences, but to be part of their own world and utilize the resources God has given them in a set apart way. In a way that honors Him, leaves room for Him. There’s something more important underneath all the constant texting and listening to playlists; sometimes misguided Facebook, Instagram, or YouTube posts or comments; and even eye-rolling or outbursts when tech-free time is imposed. Perhaps there’s a silence or loneliness your teen doesn’t want to feel. Questions they don’t want to face. Only when thumbs are still and music is quiet can we hear God (Psalm 46:10). Only when we set aside all our manmade devices can we see His Creation (Psalm 19:1). And only when we stop to consider His greatness will we be drawn to praise Him (Psalm 77:12). At that point, we will realize our need to make less of ourselves and more of Him (John 3:30) and even begin to understand devotion like that of John or Paul in the Bible, no less attempt to mimic it ourselves (Philippians. 1:21). 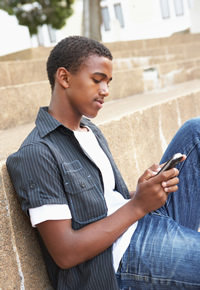 On a positive note, research indicates that teens do report various types of purposeful online interactions. Each person’s experience with social networking is different, but most have had positive interactions and grown to feel closer to others through it. However, others have seen negative effects of posts or comments that they’ve made. 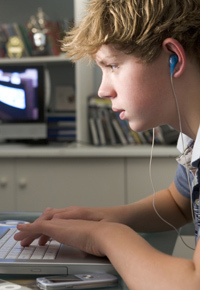 Unlike the seeming disconnect between online personas and real-life reputations that the pioneers of online socializing thought was there, many of today’s teens understand that their online behavior counts. As a result, though, many have learned how to hide information from some people, namely Mom and Dad. Some even have separate Facebook accounts for interacting with family versus friends. When we have meaningful communication with our Lord, we won’t hide. Or need to. We’ll invite God into all corners of our world — online and otherwise — desiring His presence and evaluation (Psalm 139). That might not mean today’s teens want all their social interactions seen by Mom and Dad, just like you didn’t want your diary read, but still. In the end, even our idyllic memories of shared lemonade on the front porch don’t measure up. When teens understand their deepest need and most gratifying relationship are met in God and Christ, they’ll be different from others in their generation (Romans 12:2). The thing is, so will we. On average, 93% of American teens go online regularly; 80% of these teen internet users are involved in at least one social networking site. On the high end of the spectrum, 92% of web-savvy girls ages 14 to 17 are involved in social networking. With 93% of teenage social media users having Facebook accounts, we might as well talk about the potential dangers specifically relating to Facebook and how parents can help curb these dangers. In this article, we’ll focus on the potential dangers and typical parental responses. • 55% of teens admitted to giving out personally identifiable information to people they don’t know. • 29% of teens admitted that they have posted mean or embarrassing information or photos of others. • 29% of teens say they’ve been contacted by or even stalked by someone they don’t know. • 24% of teens have had embarrassing or private information about them made public without their consent. Clearly, some parental guidance is needed in order to help teens avoid falling prey to dangerous or demeaning situations as well as to prevent them from victimizing others. • 88% of parents realize that their teens communicate online with people they don’t know in person. • 61% of parents are primarily concerned with their teens sharing personal information online. • 40% of parents worry about their teen’s safety due to social networking, even when they’re at home. • 60% of adults think parents should have complete access to teens’ online activities. When you consider the fact that most parents are far from ignorant of dangers, it’s a bit surprising that only 34% of parents check up on their children’s social networking. Maybe part of the reason is that their children have expressed their own perspective on such “spying”: 39% believe their online activities to be private, and a close 38% say they’d be offended if their parents utilized Facebook parental controls. An additional 25% say they’d be shocked or hurt to find out their parents were spying on them. On the flip side, 67% say that they can hide their online activities from parents, and 43% say they would change how they behave online if they knew their parents were watching. Photo credits: Top © Andres Rodriguez / Fotolia. Bottom © listercz / Fotolia.